The 8th Annual International Gay Polo League Tournament was held from April 6-9 this year in Wellington, Florida at the International Polo Club Palm Beach – Isla Carrol Field West. This year the Seminole Casino Coconut Creek defeated Goshen Hill for the Founder’s Cup by a coin toss after ending the game 4-4. Cedar Crest Stables took home the Senator Cup, besting RSM after a penalty shoot-out. Speaking with Chip McKenney, the president and founder of the Gay Polo League (GPL) said “the level of play gets better and better and I think, by far, this was an extraordinary year as far as polo goes for us.” He is also excited by the fact that each year there are new players on the field and new spectators there to cheer on the teams to victory. Although he plays for RSM, the team that lost the Senator Cup to Cedar Crest Stables, McKenney went on to say, “Even though we came in second, I’m very happy for the winning team because Cat Malone and Cedar Crest Stables have supported us from the very beginning. The tournament was presented again this year by the Palm Beach County Human Rights Council (PBCHRC). Rand Hock, president and founder of the council said in an interview with Ryan Yousefi for the South Florida Gay News (SFGN) that he’s attended the Gay Polo League Tournament since its inception and is amazed to see how it’s developed over the last eight years. ‘Mason also told us that GPL was encouraging people to decorate their tailgate spaces, and there would be prizes in several categories. He really wanted it to develop into the premier LGBT-friendly sporting (and social) event in Palm Beach County,’ said Hock. And that it has! Individual teams of tailgaters come up with a theme and then let loose, creating everything from an airline cabin to a wedding chapel to a take on the Arabian Nights. You’d be hard pressed to find a more fun yet sophisticated and exciting sporting event than the International Gay Polo League Tournament. 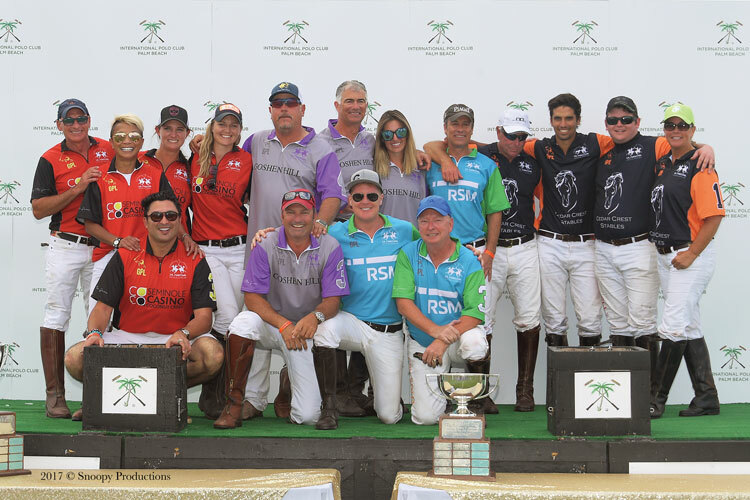 Over the years the event has continued to grow, attracting some of the very best polo players from around the world. And the pre- and post-match festivities with the tailgates where teams let their imaginations and senses of humor run wild have become a fabulous fixture of the event. As a self-pronfessed Anglophile I was thrilled that this year’s winner was an over-the-top British theme with Union Jacks displayed everywhere – on banners, furniture, even on the lenses of the team’s sunglasses. God Save the Queen(s)! But underneath the incredible athletes and their amazing horses, the glitz and glamour of the upscale affair and the fun of the tailgates, there are two men responsible for bringing this event to life – Phelps and McKenney. A longtime supporter of a number of charities, after losing his brother to AIDS in 1996, Phelps co-founded the Equestrian AIDS Foundation and has been named one of SFGN’s OUT50 Palm Beach for 2017. As an enthusiastic polo player who once felt like he was the only gay man who wanted to play the game, McKenney actually moved from California to Florida and now serves as CEO/CFO of Phelps Media Group in addition to his role as president and founder of the GPL. Their shared passion for horses, polo and giving back to the LGBTQ sports community has led McKenney and Phelps to merge their respective talents to create and grow this annual tournament and, in the process to create a new area of sports diversity for polo lovers within the LGBTQ community and beyond.